Juice and Java Lounge, Surry Hills is quite possibly my new favourite coffee spot in Sydney – which is pretty high praise from a total caffeine addict. It doesn't look much from the outside and the inside is a tad cramped with tables, but I assure you this place is a winner. Located on Elizabeth Street not far from the corner of Cleveland, this little beauty does more than just coffee. 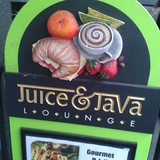 As the name would suggest, Juice and Java sell a range of delicious sounding juices and also cater for your breakfast or lunch needs. Juice, coffee and food: this place really does cover all bases so is the perfect place to bring a group with different tastes or to come alone if you are just not quite sure what you feel like. I must say the coffee hit is INTENSE and the standard strength (for Juice and Java) coffee they produce is not for the faint hearted. I ordered a Long Macchiato (my usual coffee) and was specifically told that I had better like strong coffee, which is fine because I do but I can imagine it would be a bit much for some. With that said, they are more than happy to make you a weaker brew if you are so inclined and do not want to spend the rest of the morning literally buzzing. As for the food, all bases are covered with the normal toast, muesli, egg based breakfast selections and a tasty range of sandwiches and salads available for lunch. The staff are super friendly and it was lovely of the barista to check that I would in fact enjoy my ridiculously strong beverage, plus he wished me an amazing day! A bit of friendly service goes a long way and when coupled with amazing coffee and tempting food it makes Juice and Java a must try when in the neighbourhood. If you love their coffee as much as I do but don't live close by, don't fear you can buy some of their beans while you are there and get your hit whenever you feel like it. Also one of our favourite coffee places but it closed down ages ago. Has it reopened?